I first met Naomi Uyama in a downtown New York music club five years ago. Soon, we adjourned to the sidewalk. It’s less melodramatic or noir than it appears. The club was Banjo Jim’s — ‘way down yonder on Avenue C — where a variety of jazz-folk-dance groups appeared in 2009. The most famous was the Cangelosi Cards, in their original manifestation, featuring among others Tamar Korn, Jake Sanders, Marcus Milius, Cassidy Holden, Gordon Webster, Kevin Dorn. Tamar, who has always admired the Boswell Sisters, got together with singers Naomi and Mimi Terris to perform some Boswell numbers as “The Three Diamonds.” On one cold night, the three singers joined forces on the sidewalk to serenade myself, Jim and Grace Balantic, and unaware passers-by with a Boswell hot chorus of EVERYBODY LOVES MY BABY. Tamar has recorded on her own, as has Mimi, but I and others have been waiting for Naomi to record, to share her sweet swing with the world. And the disc is delightful. The first thing one notices about the disc is its authentic swing feel courtesy of players who have a deep affection for a late-Basie rhythmic surge and melodic ingenuity: Jake Sanders, guitar; Dalton Ridenhour, piano; Jared Engel, string bass; Jeremy Noller, drums, and a two-person frontline of Adrian Cunningham, tenor saxophone and clarinet; Matt Musselman, trombone. The band is neither over-rehearsed or overly casual; they provoke regular movements of the listener’s head, torso, and limbs. (I can attest to this.) They aren’t busily copying the sound of classic recordings; they are swinging out in fine style. I heard echoes of Illinois Jacquet and Al Grey, of a Buddy Tate band uptown or a Forties Jay McShann small group, of Tiny Grimes and Sir Charles Thompson — those players who swung as reliably as breathing. The band never gets in Naomi’s way, and they make happy music for dancers, riffing as if to the manner born. Naomi’s voice is a pleasure in itself — no rough edges, with a wide palette of timbres, but perfectly focused and with an effective phrase-ending vibrato. She doesn’t sound like someone who has spent her life memorizing Ella, Billie, or a dozen others; she sounds, rather, like someone who has fallen in love with the repertoire and decided to sing it, as if she were a bird bursting into song. In swingtime, of course. On Lil Johnson’s seductive encouragement, TAKE IT EASY, GREASY, she does her own version of a Mae West meow, but she doesn’t go in for effects and tricks. Her phrases fall in the right places, and she sounds natural — not always the case among musicians offering milkless milk and silkless silk in the name of Swing. And I had a small epiphany while listening to this CD. A front-line of trombone and reed (mostly tenor) is hardly unusual, and it became even less so from the middle Forties onwards, but it makes complete aesthetic sense here, because the spare instrumentation (two horns, powerful yet light rhythm section) gives Naomi the room she needs to be the graceful and memorable trumpet player of this little band. Think, perhaps, of Buck Clayton: sweet, inventive, bluesy, creating wonderful phrases on the simplest material, and the place Naomi has made for herself in the band seems clear and inevitable. The songs also suggest a wider knowledge of the Swing repertoire than is usual: Basie is represented not with a Joe Williams blues, but with the 1938 GLORIANNA, and the Dorsey MARIE is an evocation rather than a small-band copy. There are blues — I KNOW HOW TO DO IT and the aforementioned TAKE IT EASY, GREASY — as well as classic pop standards that feel fresh: I CAN’T GIVE YOU ANYTHING BUT LOVE, ONE HOUR, LOVER, COME BACK TO ME, AFTER I SAY I’M SORRY, GOODY GOODY, IS YOU IS OR IS YOU AIN’T MY BABY, WHAM, and THIS CAN’T BE LOVE. The disc offers nothing but good music, never ironic or post-modern, neither copying nor satirizing, just beautifully crafted melodic Swing. 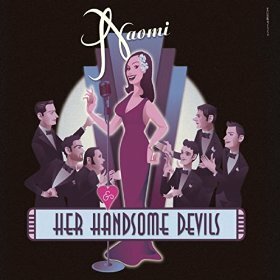 Welcome, Naomi — with your Handsome Devils alongside. On with the dance! Now, some bits of information. You can find Naomi on Facebook here; the band has its own page here. To buy the disc (or a download), visit here, where you also can hear samples of the songs. To hear complete songs, visit here. Naomi and a version of her Devils can be found on YouTube, and here is her channel. Enough data for anyone: listen to the music and you’ll be convinced. The Cangelosi Cards provoke enthusiastic affirmations wherever they go. And recently they’ve gone as far as I can imagine — to the House of Blues and Jazz in Shanghai, China for a three-month residency. They’re returning for gigs between October 22 and November 4, including a stint at the Nanjing Jazz Festival, October 22nd-28th. The group will also make a four-city tour including Nanjing, Suzhou, Shanghai, and Beijing. I am cheered by their widening circle of friends. But for those of us who can’t drop everything and follow the Cards to China, there’s new musical evidence to savor. Tamar and the band loved the music of the Boswell Sisters — not only the beautiful repertoire and hot solos but the vocal harmonies and sophisticated arrangements. I saw Tamar and her sweetly singing friends Naomi Uyama and Mimi Terris create their own variations on the Boswell repertoire. I remember their acapella rendition of MOONGLOW performed on the sidewalk outside Banjo Jim’s brought me to tears. Now that experience has taken tangible shape, for Tamar, Mimi, and Naomi, as “The Three Diamonds,” have recorded a mini-CD of three selections backed by the Cards (Gordon Webster, Dennis Lichtman, Jake Sanders, Matt Musselman, Cassidy Holden, and Marcus Milius). It’s extraordinary music — connected by a celestial theme: STARDUST, MOONGLOW, and the lesser-known WHEN MY BLUE MOON TURNS TO GOLD AGAIN. The EP will be available at the Cards’ shows and can be purchased online at www.losmusicosviajeros.net for $3 plus shipping. And since the Cards are back in New York City for a moment, they can be experienced at Harefield Road, where, to quote Jake, they’re “inviting a bunch of folks out this Sunday, some good friends-fine players from other groups.” Harefield Road is on Metropolitan between Graham and Humboldt in Williamsburg, Brooklyn, the third stop on the L. The Cards will play from 5 to 9. Members of the band will also be playing at MOTO (http://www.cafe-moto.com) on Friday nights from 9 to midnight. And they will also be presented in concert by the New Jersey Jazz Society — at the Bickford Theatre in Morristown, New Jersey, on October 11. The concert begins at 8 PM: tickets are $15 in advance and $18 at the door. The Bickford Theatre/Morris Museum: On Columbia Turnpike/Road (County Road 510) at the corner of Normandy Heights Road, east of downtown Morristown. The hall is near Interstate 287 and the Route 24 Expressway. It seats 300 and there’s ample on-site parking and wheelchair access. Weeknight concerts are one long set (8 to 9:30 PM). Tickets may be purchased via credit card over the phone by calling the box office at (973) 971-3706. The box office can also provide information and directions, or email Jazzevents@aol.com. The performance the Cangelosi Cards put on, casually but with great skill, at the Shambhala Meditation Center, stands out as one of the great sustained musical evenings of my life. Jake assured me that the Cards will be coming back to us! Here are four more performances from the Cangelosi Cards’ Feb. 27, 2010 evening at the Shambhala Meditation Center in New York. Everyone knows or should know by now who the Cards are, but if you’ve come late to this particular version of swing enlightenment, they are Tamar Korn, vocals; Jake Sanders, banjo; Dennis Lichtman, clarinet and electric mandolin; Marcus Milius, harmonica; Gordon Au, trumpet; Debbie Kennedy, string bass. Thanks to Paul Wegener for booking the Cards at Shambhala for what I hope is a long series of memorable evenings. Thanks to Paul Wegener, Jake Sanders, Tamar Korn,Gordon Au, Debbie Kennedy, Marcus Milius, and Dennis Lichtman. I’ve been parcelling out these delicious performances by the Cangelosi Cards, being reluctant to come to the end of the music I recorded. And my reluctance is especially strong because I’ve learned that the Cards now have an extended gig (two months?) in Shanghai. If they can’t fix US-Sino relations, who could? So here are two more from the video cookie jar — I don’t want my viewers to spoil their appetites! Thank you, Tamar, Jake, Dennis, Gordon, Marcus, and Debbie! And if all of this is new to some viewers, they need only go back a few blogposts to read and experience the whole story — the best homework assignment any academic could impose. More to come!